Chamaripa, the top and most professional international elevator shoes brand. 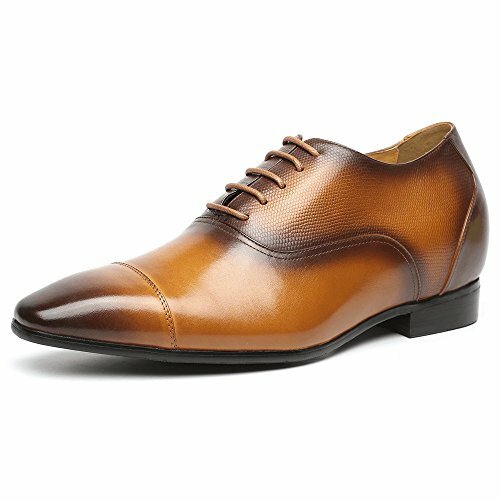 Chamaripa Shoes corporation had founded in 1996, manufature premium men's elevator shoes using the philosophy of quality, service and integrity. Taking shoemaking to the level of an art form, each pair of Chamaripa shoes are carefully crafted by hand in a process that includes at least 32 separate production steps. No detail is too small, because supreme quality is the cornerstone of the Chamaripa name. Features with cap toe,lace-up closure;Elegantly stitched. The WHOLE Insole Elevator Layer conforms to the arch foot,Comfortable and Durable. Size tips: The size of elevator shoes is different from regular shoes,pls look at the size chart on the left picture. All shoes are true to size. Pls check our Width Selection if you have wide feet. Noted:If you are first time wear height increasing shoes, you may need 3-5 days to used to it. And you can practice at home before wear them out. And then you'll feel taller, more confident.